(CNN) -- The pilot of Continental Flight 61 died Thursday as the plane flew from Brussels, Belgium, to Newark, New Jersey, the Federal Aviation Administration and Continental Airlines said. 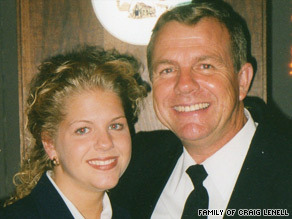 Pilot Craig Lenell is shown with daughter Jennifer Lenell-Small, a former Continental employee. The 60-year-old Newark-based pilot died of "apparently of natural causes" about halfway through the flight, the airline said. He had 32 years of service with Continental, it said. The pilot's family identified him to CNN as Craig Lenell. The airline said the crew on the flight included an additional relief pilot who took the place of the deceased man, and "the flight continued safely with two pilots at the controls." The Boeing 777 landed safely at Newark International Airport at 11:49 a.m. ET Thursday, the airline said. No further details were given. Continental did not release the pilot's name. Asked whether the plane's 247 passengers had been told of the situation, a Continental spokesman said only that the plane had arrived safely. "I haven't heard anything." passenger Chris Balchuas, from Houston, Texas, told reporters after the flight. "They just said there was a medical emergency and were there any doctors aboard." Another passenger, Dr. Julien Struyzen, said he responded to the request for a doctor and pronounced the pilot dead. "He was clinically dead when I came in," Struyzen said. Flight personnel asked him if anything was possible, and he said "it was not." He did not give additional details. Balchuas, after being told what had happened, said, "Oh, that's scary. I didn't know anything about that." He said nothing was unusual about the flight, just that about "four or five fire trucks and a whole bunch of medical emergency teams" met the plane when it landed. The plane landed without any problem, he said, and a medical examiner met the plane to help handle the situation. CNN's Mike Ahlers, Mark Norman, Mary Snow, Kiran Khalid, Jason Kessler, Allan Chernoff and Eden Pontz contributed to this report.